Artful Affirmations: Tea Cup Tuesday from Home! I am home today and excited to share my new Marie Antoinette tea mugs with you. Why tea mugs you say? I did look and look for for a special tea cup to bring home. I ended up with these two that I bought at the Petite Trianon gift shop at Versailles. They are patterned after china of Marie's. They did have replicas that were tea cups, but they were 120 Euros and up. So, I decided to bring these two lovely ones home. I think they are adorable. They are new, of course, and made in France. I love the little delicate spray of flowers around the top. Next week I will be back with vintage cups to share with you. The books and postcards in the photo are vintage and from my trip to Paris. I did finally purchase a number of really nice things at some flea markets. This Friday I will be sharing about my favorite flea market and some of the treasures I found there. I have also made some Blueberry muffins this morning to have with my tea. I drizzled a little lemon sugar frosting on them for extra yumness. These are gluten free muffins, and they are delicious! I will also be starting my first giveaway for French Friday...so come by for a visit to see what I am gifting to some lucky winner! Oh well, I will have to wait for French Fridays to relive it as I share more photos with you. If you want to join us in Tea Cup Tuesday, all you need to do is fill in the two blanks below and we can come see you and your lovely china. Martha and I love hosting this festivity. We so much enjoy visiting all of you. Make sure you stop by Martha's lovely blog as well. Have a terrific week, and wishing you a Happy Teacup Tuesday! Welcome home! I know you had a marvelous trip! Welcome home, Terri! Your trip to France sounds like it was just wonderful. Your mugs are beautiful and a wonderful memory of your trip. i love your tea cups !! I didn't know we could get those at the petit Trianon.i happen to be French and live near Versailles !!!! I do a lot of table scaping and crafting myself. Thanks for your tutorial for making those flowers.they are wonderful !!! Hope to hear from you soon.I have recently posted two articles about our visit to MOnet's Giverny's house and garden !!! these cups are so pretty, and the muffins look delicous. Yummy! I enjoyed my visit, and will visit again. Happy teacup Tuesday! Welcome home Terri! I really enjoyed your posts from France. It was fun to get a little taste of what you were experiencing. I love your pretty tea mugs! Lovely! Its so nice to know you are home safe and sound and filled with wonderful memories!! I bet your trip went by in a snap of a finger! Your teacups are so sweet and delicate - so Marie! And regarding the muffins all I can say is YUMMERS!! Such lovely mugs and what a great memory. Sometimes a mug is better for a cup of tea! Hope you'll be joining me starting tomorrow night with my meme "Where do you keep it all?" i love these two cups, they are elegant! and yes, i'll have a muffin..they look scrumptious! come by and share your tea with me! Those are just stunning and I am so glad that you had a safe trip home!! Thanks so much for sharing your trip with us!! I really enjoyed seeing Paris through your eyes!! Can't wait to see what goodies you brought home!! oh i do love your Tea cup Tuesday ... i would love to play ... i just don't have that many pretty things to share ... so i might just stick to looking at everyone's beautiful teacups! it's always such a visual feast! and welcome back! Welcome back! I am so glad to hear you ahd a wonderful time! Those cups are just so pretty! I hope you have a terrific week! Welcome back home..yay! Pretty tea cups..fabulous! Happy Tea!! Anyway next week I will visit you again with more cups of my collection "The months of the year"
Your Maria Antonieta mugs are beautiful,so you always are going to remember Paris. I very much like the teacups you bought! They are elegant and look like they would go with just about any tea setting you desire to place them with! I am looking forward to reading more about your trip to France! Thank-you for hosting this Teacup Tuesday! Terri, welcome back! Your photos were a delight to view! 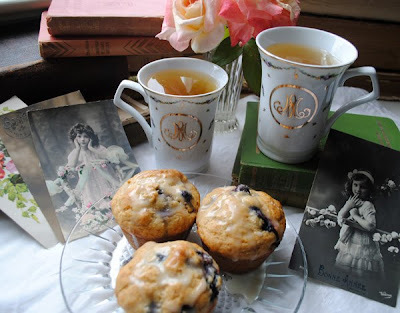 Love your tea mugs and those muffins look absolutely delish! Makes me want to get in the kitchen and bake! Those photos of the macaroons were so yummy looking...which was your favorite? ahhhhh... tea. Thanks for my cuppa. Just wonderful. Blessings friend. So glad you made it home safely and I know you have lots of stories to tell us and pictures to show us. How magnificent you got to go on this dream trip. I enjoyed every single minute too!!! What a glorius time you had! Hope someday to go there with my daughter. She loves Paris and brought me home a souvenir with Marie Antoinette design on it. Thank yo for taking time to stop in for tea. Looking forward to French Friday and more. Are you back on your normal time now? Did it take a lot out of you? I'm glad you enjoyed your walk! Such lovely cups your brought home from France! Oh you make your trip sounds so wonderful, as I am sure it was! Thank you for sharing it, I had so much fun reading about France and your Tea Room last week! Love blueberry muffins! Hi Terri! Sounds like you had a wonderful time in France... you lucky lady you!! I love the tea mugs you brought home. So pretty! Thank you for hosting this party! Hugs! What a lovely post! The cups are very pretty. It is wonderful that you had such a good time in Paris and arrived safely home with so many good memories. I did not join the TT, but did post a story on drinking tea along the river. Maybe you would like to look at Marie Antoinette's shoes? Welcome Home. It has been a treat to read about your vacation; thank you for sharing it with us. 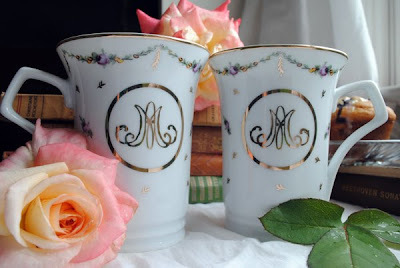 The Marie Antoinette tea mugs are pretty. Sometimes a mug is best :) . Take care. I never buy souvenirs ... and that I always kick myself when I come home! WELCOME HOME - looking forward to more tales of your adventure and photos! Terri, The mugs are just stunning. Thanks for sharing and welcome home. Welcome home, Terri! Your cups are divine and so are those muffins!! You must share that recipe as I have a friend who has gluten issues and that would be such a treat for her. Rest up and I cannot wait to hear more of your fabulous trip. Sounds like you had a wonderful time in dear old Paris and brought home some treasures. can't wait to see all the precious finds that you have to share. Your M A tea mug are so refined and extremely elegant. Hope you do not mind I've helped myself to a muffin. they looked so yummy I simply couldn't keep my hands away from them. Beautiful post, Terri. Glad you have made it home. Love you site. It is very inspiring. Thanks for sharing all the lovely pictures. I think I'll do some baking today. Welcome home, Terri. It was fun seeing all the beauty of France that you saw and shared with us. I have been waiting for your return and have been checking every few days. I love your blog so much. It is so inspiring, colorful, and filled with yummy art. Again, welcome home. Glad you seem to have had a Fabulous Time!! Those tea mugs are absolutely gorgeous!